Photos of the red carpet here. Truly some big misses tonight. Maggie Smith wins best supporting actress for Downton Abbey Season 2. Game Change won best tv movies or miniseries. Juliane Moore wins best actree in TV miniseries or movie for Game Change. Damian Lewis wins best actor for Homeland. He lists a slew of people he wants to share the award with, and thanks everyone under the sun, but never mentions Claire Danes. An oversight? Homeland also won best tv series. 9:01 pm: The full winners list is here. (I switched to "24" at 8, so didn't catch the past hour. 7:55 pm: So glad Christopher Walz won best actor in Inglourious Basterds. He was great as the SS officer -- there were so many facets to the character's personality, it was like five characters in one. 7:05 pm: I always love when Merly Streep wins and she deserves it for Julia and Julia. Really emotional and moving acceptance speech, you could hear a pin drop. 6:45 pm; Julia Roberts sitting next to Paul McCartney. Cher looks great. This is such a much better show than the Oscars. Avatar first nomination: Best original score. Will it win? No, "Up" wins this one. The red carpet arrivals are beginning. You can watch them on E! Who looks great? Who miscalculated? It's my favorite part of the show. Last year we didn't get a red carpet because of the writers' strike. And 2007 was just so-so. I think they will put double the effort into this year's show. 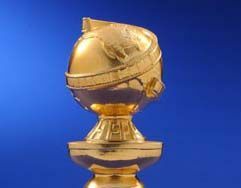 The nominees for this year's Golden Globe awards have been announced. Here's the list. Some of the nominees' reactions are here and a summary is here. I haven't seen any of the nominated films yet, but I'm now looking forward to seeing Mickey Rourke and Marisa Tomei in The Wrestler, Javier Bardem in Vicky Cristina Barcelona and Leonard DiCaprio in Revolutionary Road. The TV ads for Benjamin Button have me overdosed on the film already. Frost/Nixon has gotten great buzz and MILK is reportedly excellent as well. Australia, which I think will be great, isn't on the list. The Reader looks fairly promising. Which ones look good to you? And now for something different. 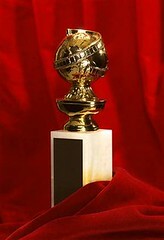 The Golden Globes are about to begin. The dresses and hairstyles are the best part for me. If you watch tonight, let us know who you admired and who you thought was a dud. I also love that it covers both tv shows and movies, and takes place in such a different setting than the Oscars. Update: Pretty boring so far. As I expected, the best part is the dresses. Very few faux pas so far. Most of my favorites for the awards didn't win, but the night is still young. Update: Excellent tribute by Tom Hanks to Warren Beatty. Annette just glowed. I wondered why no one mentioned the Parallax View, though. 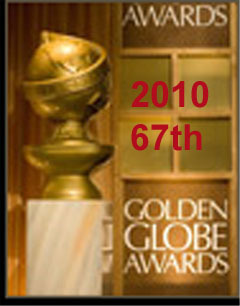 The 2007 Golden Globe nominations were announced this morning. I haven't seen Babel or several of the films, but I did like Martin Scorcese's The Departed a lot and am glad to see Leonardo DiCaprio get a best actor's nod for it. How strange that he's running against himself -- he's also up for the best actor award for Blood Diamond, another film I am anxiously awaiting. The Departed's nomination for best picture seems like a stretch though -- and I would have liked am glad to see Jack Nicholson get a nomination for it. As for the tv nominations, I hope Grey's Anatomy wins them all. I am seriously addicted to the show and every one of its characters.